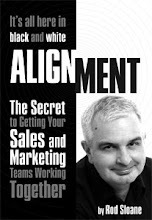 Sales and Marketing Alignment Blog from Rod Sloane: Showing Up! I am showing up on this blog, by trying to be and give you my best. I am no fan of namby-pamby, wishy-washy ideas or actions. Do it properly or don't bother at all. All that sort of thinking. I struggle with ideal small talk with people I will never meet again. Don't like being at the margins of events or organisations. Now, I have don't need to be the centre of attention, it's just when I'm there i want to be there rather than anywhere else. I want to be with you on this blog right now rather than doing anything else. By the way, thanks for reading this far, I appreciate it. So what have I been bleating on about? Showing Up is my core process. Core process is what I discussed in my last blog yesterday. Showing Up is easy for me. When I want to be there. Sometimes I have to make a conscious decision that when I plan to go somewhere that I intend to show up and give my best, not just turn up and see what happens. When I'm focused on my Core Process life, work and probably living with me is a lot easier. And that difference is, of course, for the best. Are you worth talking about? Who’s the Celebrity in your Business? Why you need to be Irish? When are you are at your best?